For every inch the head moves forward in posture, it increases the weight of the head on the neck by 10 pounds! That's a telling statement. 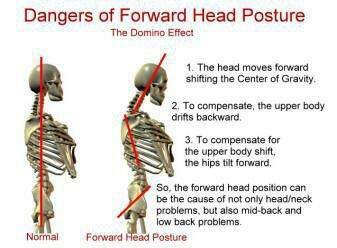 Forward Head Posture can cause head and shoulder tension and lead to pain. All of this is caused by everyday hurdles that face us, such as stress, computer work, laying on the couch (couch neck), reading, and texting (text neck). Long term abnormal neck posture can lead to muscle strain, pinched nerves, disc herniations, and arthritis. The damage and repetitive stress can be long lasting and irreversible if left uncorrected. Have you ever seen someone whose head leans forward and their head seems to be an eternity away from their shoulders. Is this you? Is this Someone you know?? What do you do about forward head posture? Chiropractic care is a highly recommended treatment option for Forward Head Posture and Magna Chiropractic provides safe and effective treatment options to keep you fit, active, and healthy. We offer safe, gentle adjustments along with rehab exercises and various other types of treatment plans. For more information, give us a call or visit our website.